I've been messing about with the Finnish Mig-29 and after a lot of trial and error have successfully changed the loadout to 4x RBK500 and 2x R73. Everything seems fine with the R73 but the RBK500 have no animation for when they leave the aircraft and before they hit the ground. They disappear off the hardpoints on the wings as normal but then vanish rather than flying through the air to hit the ground. The explosion on the ground appears correct and makes cluster impact craters. Have I missed something? Do I need to tweak an option to show the correct dropping effects for the RBK500? You are missing a TCompositeHappening. Open the ApparenceModel module and look at the Actions list. You should see one TCompositeHappening (for the gun) and two or more TSoundHappening (2 for each missile weapon; I presume for each wing). You will need to add a TCompositeHappening that contains the correct TBombHappening, so you should find an existing unit that uses the bombs you want, then add the same reference to your custom Mig-29. 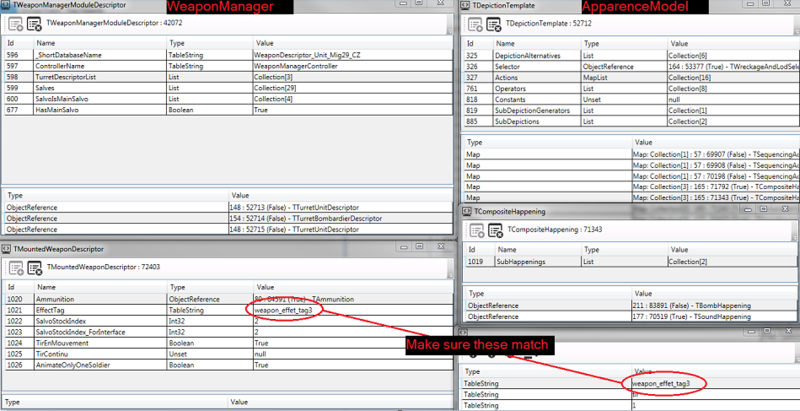 Make sure your new reference uses a weapon_effet_tag that matches the one in the WeaponManager module. I used the Czech napalm Mig-29 in the example. Many thanks for the helpful response. I had a look on the actions module and as you say I appear to be missing a TCompositeHappening for the RBK500. I found one on the Soviet Mig-29 that I can use but I can’t work out how to add a TCompositeHappening to the list. The “+” button appears to be greyed out. Am I unlucky and the Finnish Mig-29 is hardcoded to only have the default 2x R77 and no extra weapons? Thanks for the help so far, sorry this is my first go at modding and I chosen a tricky subject! You have to double click on the actions list to bring it into its own window. Ah right yes I’ve got that now. Err, so I can’t seem to get the adding of a TCompositeHappening quite right. After choosing “add new row” I’m not sure what to choose from the drop-down menu. Is it “map”? I experimented with this but I got a Collections before the reference I chose for the RBK500. This now seems to result in the game crashing when I start it up so I’ve reverted to a previous saved version of ndf_win that had the Mig-29 working but without any bomb animations. Click twice slowly on another reference in the list. It should expand and reveal the kind of value it is. Copy that structure for all items in that list. Fantastic! That did the trick. Thankyou so much for all your help! Could anyone tell me how do you add or remove a faction from a coalition? Is it easy and/or quick? 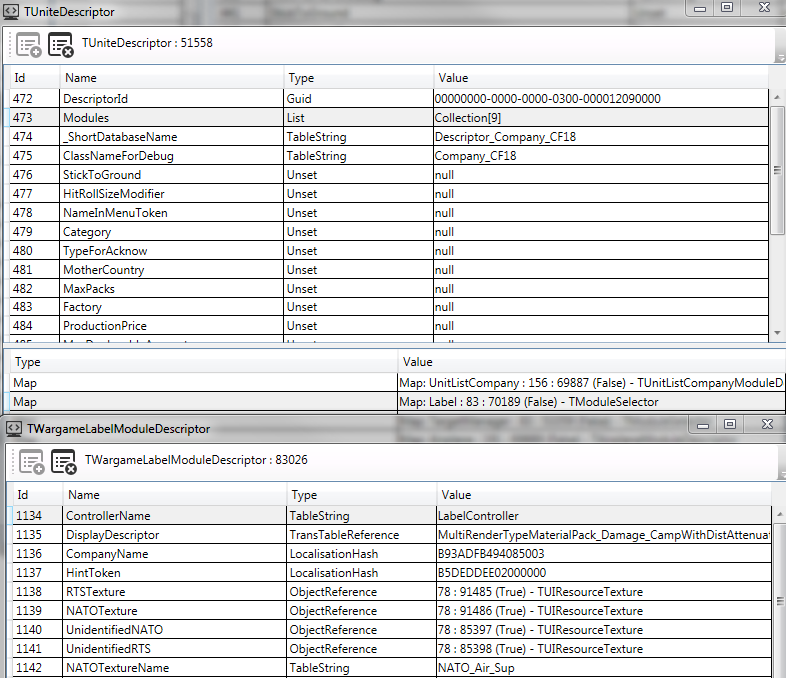 TDeckAttributes > MapCoalitionToCountry > Select desired coalition in collection > Add/Remove your faction! Last edited by DiWalo on Fri 17 Aug 2018 14:50, edited 1 time in total. The Finnish Mig-29 still shows up as an ASF in the armoury and deck builder after I've changed the loadout. Is there a way to tweak the unit type to multi-role and change the little plane icon? iampoundfoolish wrote: Sorry one other thing. There are two locations. I recommend you find another aircraft to imitate. The first one is in the TypeUnit module. You are interested in the TypeUnitHintToken. The second is in the CompanyUnit module. 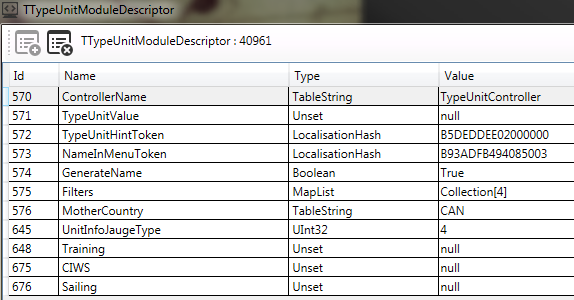 Open it until you reach the TUniteDescriptor, as in the screenshot, then open the list of modules. Within the Label module, you are interested in HintToken, RTSTexture, NATOTexture, and NATOTextureName. If you want to go the extra step, you can modify the armory/deck filters within the TypeUnit module. Within the Filters list, there are four categories. Furthermore, if you are worried about the AI, there are two locations you should change to modify their behavior. The IAStratModule module should be matched to another existing unit of the same type. This module also exists within the CompanyUnit module's list of modules. If you want to change the radio acknowledgement when commanding a unit, you should edit the AcknowUnitType and TypeForAcknow values on the main unit page. Wow, so much helpful info. Thanks for all this! Think I’ve got it all sorted now. The only thing I struggled with a bit was the armory filters but I’m not too bothered by those. I have to say Eugen don’t make modding easy, or possibly I’ve got off lightly in the past as I’ve only tried to mod Paradox games. Anyway, thankyou very much Sireyn!